King County monitors the ecological health of Newaukum Creek in a variety of ways, including collecting and analyzing water, sediment, and benthic invertebrate samples. Since 1972, water quality samples have been collected 1 mile upstream from the mouth of Newaukum Creek at station 0322, which is located at the U.S. Geological Survey (USGS) gaging station near the bridge at 212th SE Street. Sediment samples have been collected from Newaukum Creek as part of the Streams Sediment Monitoring Program starting in 1987. King County began collecting benthic macroinvertebrate samples in Newaukum Creek in 2002. From time to time, additional studies have been conducted at various streams in King County. Click here for information about Special Studies. The Newaukum Creek watershed is located in South King County in Water Resource Inventory (WRIA) 9 and drains an area of approximately 27.8 square miles (Kerwin and Nelson, 2000). The creek originates in the mountains east of Enumclaw Plateau, flows for roughly 14 miles, and enters the Middle Green River at River Mile (RM) 40.7. Eight tributaries to the creek provide and additional 13.5 miles of stream length. Total land use in the Newaukum Creek basin has gone from historic forested lands to agriculture and now to rural residential. The upland part of the basin was noted to consist primarily of commercial forest production in 2000 (Kerwin and Nelson, 2000). This area is located outside the Urban Growth Boundary (UGB) and will likely remain in commercial forest production. The mid-section of the creek is known as the Enumclaw Plateau and consists of agriculture (pasture/hay), low-density residential, and low-to-high density residential and commercial land uses. The Enumclaw Plateau area occupies approximately 57% of the basin. The basin also has scrub, wetlands, and other land uses (barren land, grassland, and open water). See Table 1 below for more details on land use. Chinook, coho, sockeye, and chum salmon, as well as winter steelhead, have been observed spawning in Newaukum Creek (Kerwin and Nelson, 2000). Resident and anadromous cutthroat have been observed throughout the basin. This subbasin of the Green-Duwamish watershed is considered to be a major producer of winter steelhead, coho, and Chinook salmon. The Newaukum Creek Basin Characterization Project Report provides more detailed information about habitat conditions in the Newaukum Creek area. State water quality standards were revised in 2003. Newaukum Creek is now categorized as “Core Summer Salmonid Habitat” for aquatic life use, and “Primary Contact” for recreational use. As part of the updated water quality standards, Newaukum Creek has been assigned an additional “Supplemental Spawning and Incubation Protection” temperature criteria of 13 ºC to be applied from September 15th to July 1st. 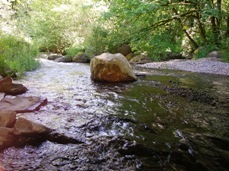 The creek is on the Washington State Department of Ecology’s (Ecology) 303(d) list for violation of DO and FC bacteria standards (Category 5). The creek has an EPA-approved Newaukum Creek Temperature TMDL plan in place and implemented (Category 4a). A 25-year (1979 – 2004) trend analysis was conducted with baseflow water quality data collected from the mouth of Newaukum Creek. This analysis shows that there have been some improvements in water quality since 1979. Total suspended solids, ammonia, total nitrogen, and FC bacteria have all shown a significant decrease in this 25-year time period. pH values have shown a significant decreasing trend. However, conductivity and phosphorus concentrations (both ortho-phosphorus and total phosphorus) have increased significantly during this same time period and pH levels have lowered. In spite of improvements noted since 1979, a water quality data assessment conducted for the Green-Duwamish River in 2003, found that Newaukum Creek continues to have low DO and high nitrate-nitrogen, total nitrogen, ortho-phosphorus, total phosphorus concentrations in both base and storm flow. Such conditions are particularly prevalent at sites representing agricultural land use, relative to the rest of the Green-Duwamish watershed (Herrera 2005). Turbidity and total suspended solids were elevated in the creek during storm events. Total aluminum concentrations exceeded U.S. Environmental Protection Agency (EPA) chronic criterion during base flow sampling and acute criterion during storm flow sampling. A Water Quality Index (WQI) rating system was developed by Ecology that evaluates several water quality parameters and gives a single rating of “high,” “moderate,” or “low” water quality concern. To see how Newaukum Creek ratings compare with other stream sites, please visit the Water Quality Index webpage. King County maintains nine water temperature gages on Newaukum Creek: North Fork Newaukum at 292nd Ave (GRT28), Newaukum Creek at SE 416th and 278th (GRT29), Newaukum USGS gage (44a), Newaukum Creek at Cumber. Veasy Highway below GRT12 (GRT12b), North Fork Newaukum at Cumb. Veazy Highway below GRT12 (GRT28b), Newaukum Creek at SE 416th Street above South Fork confluence (NEW0014b), Newaukum Tributary 0121 (NEW0121), Newaukum Tributary 0118 (NEW0118), and Newaukum Tributary 0118 at North Fork confluence (NEW0118b. Sediment data were collected from Newaukum Creek as part of the Stream Sediment Monitoring Program from 1987 through 2002. Data analysis identified no significant trends for any of the parameters tested. Basin-wide sampling occurred in 2009, including ten sites along the Newaukum Creek reach. Results indicate that Newaukum Creek sediments did not exceed any sediment quality guidelines. For more information about benthic macroinvertebrates and King County’s Benthic Macroinvertebrate Program, please visit the King County Stream Bug Monitoring webpage. To see the benthic macroinvertebrate data for Newaukum Creek, please visit the Puget Sound Stream Benthos webpage. In 2001, King County initiated a separate comprehensive study of the Green-Duwamish Watershed, called the Green-Duwamish Watershed Water Quality Assessment (GDWQA). Several reports evaluate data collected as part of the GDWQA. Newaukum Creek is included in this analysis.